The path to eliminating malaria in sub-Saharan Africa requires bold steps to build on existing approaches—like using proven methods of protection against mosquitoes—with proactive, innovative ones—like targeting the malaria parasite in humans. Zambia’s National Elimination Strategic Plan 2017–2021 aims to cover all health facility catchment populations following the step-wise approach below. Each component has a corresponding set of actions to take as malaria transmission intensity changes. Malaria control relies heavily on prevention through vector control and a case management strategy that focuses on passively detected cases. Scaling up interventions like insecticide-treated bednets, indoor residual spraying, timely diagnosis, and effective treatment is the first step in reducing a country's malaria burden. Enhancing vector control and optimizing case management is essential to reducing parasite prevalence and building and maintaining gains at all levels of transmission. Building a strong information system requires a series of measures to reduce transmission to sufficiently low levels so that all cases can be detected and radically cured and all transmission foci managed. Building a “data culture” is essential to the success of the elimination strategy—ensuring that data are captured, reported, and used at every level. Once transmission has been interrupted, surveillance must be maintained, but oriented mainly towards the risks associated with case importation. When all supportive systems are in place—including health facility and community surveillance systems and trained CHWs and health facility staff—districts can consider implementing strategies and intervention opportunities to aggressively clear parasites from communities. Population-wide strategies aim to clear infections from entire communities in order to achieve very low transmission. This component is used as an ‘accelerator’ to drive down transmission to a level where the remaining cases/infections in individuals and small foci (i.e., households and neighbourhoods) can be detected and driven out to achieve a malaria-free area. Transmission reduction strategies can include drug-based strategies (such as MDA), transmission-blocking vaccines, and could—in the future—include innovative vector control methods, such as ivermectin. After achieving community-wide reduction to an operationally feasible level in a facility catchment area (approximately 25 cases per week per facility catchment area), the next step is to proactively find and treat those few infections as soon as they arise. This will require rapid and intense investigation, and will be feasible only when transmission levels are very low. 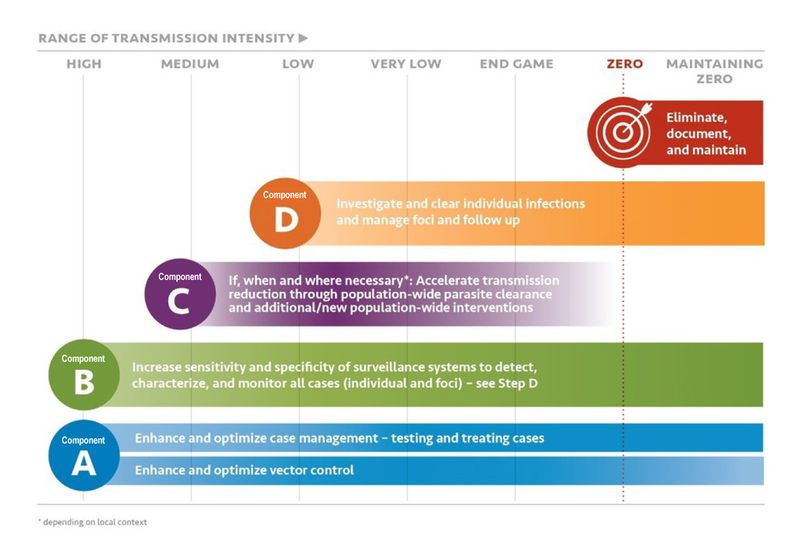 Component E is the last step to be conducted when there is no local malaria transmission, with the objective of documenting and maintaining zero transmission. The process for documenting zero should be scalable and easy to implement. A strong surveillance and response system that is able to quickly report any cases that arise and respond with investigation and treatment to prevent further spread will be key to maintaining elimination and preventing reintroduction. The surveillance system is necessary to reach zero, and will be used to demonstrate that zero has been achieved. Case investigation should continue indefinitely as a mechanism to prevent reintroduction.